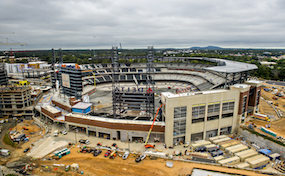 SunTrust Park opens in 2017 as the new home to Major League Baseball’s Atlanta Braves. The ballpark is supposed to have a seating capacity of 41,500 and be build for $622 million. Billy Joel will be the first concert set to take place at the venue. The SunTrust Park box office is located in Atlanta, GA although the address is technically in Cumberland. SunTrust Bank signed a 25 year partnership with the ballpark. SunTrust.ParkAtlanta.com is not a primary vendor, supplier, or affiliated with any official website. We proudly provide access to the a large selection and low prices online for all secondary market events. Ticket prices may be well below or above face value and will fluctuate with the market. To purchase tickets for all SunTrust Park Atlanta events simply click on the event of interest or call our operators at anytime.